From PBS to Jerry Lewis, I’ve seen my share of telethons but I’ve never once thought about what goes on behind the scenes, much less participated in one. 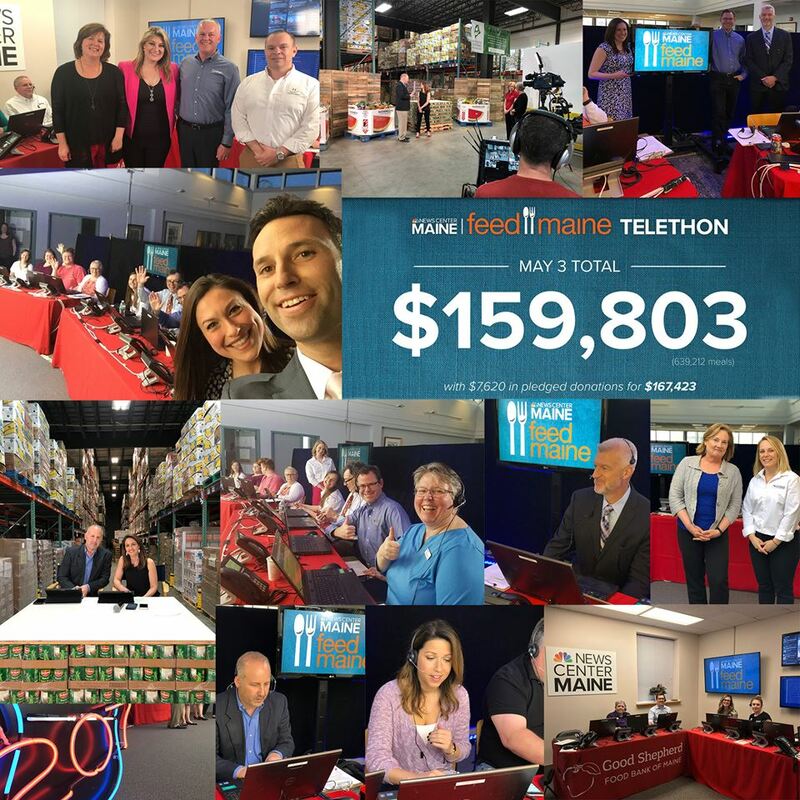 That all changed on Thursday, May 3rd when I took my seat at News Center Maine’s Feed Maine Telethon to benefit the Good Shepherd Food Bank. Over the next five hours, I learned some fascinating things about the News Center team, the people who volunteered, the companies who made big donations and my neighbors from all over the state who called in, pledged their hard-earned money and made me smile every time I hung up the phone. I’m not a morning person. When I arrived at News Center Maine’s Portland studio at 4:30am bleary-eyed and in desperate need of caffeine, Jessica Gagne of the News Center team welcomed me with a big smile, thanked me for volunteering and showed me where to find the coffee and Holy Donuts her team provided. Sustenance acquired, I made my way to the bank of 12 telephones and computers that had been set up the night before. There, a kind (and very patient) member of their production team showed us how to pick up a call and how to enter donations online. Over the course of the morning, Lee Nelson, Todd Guetner and Lee Goldberg all stopped by. Not just to say polite, dutiful hello’s but to genuinely thank us for our time, answer our questions and pose for photos. Lee Goldberg took a few phone calls and drove to the GSFB warehouse in Auburn to close out the telethon nearly 12 hours after his day began. 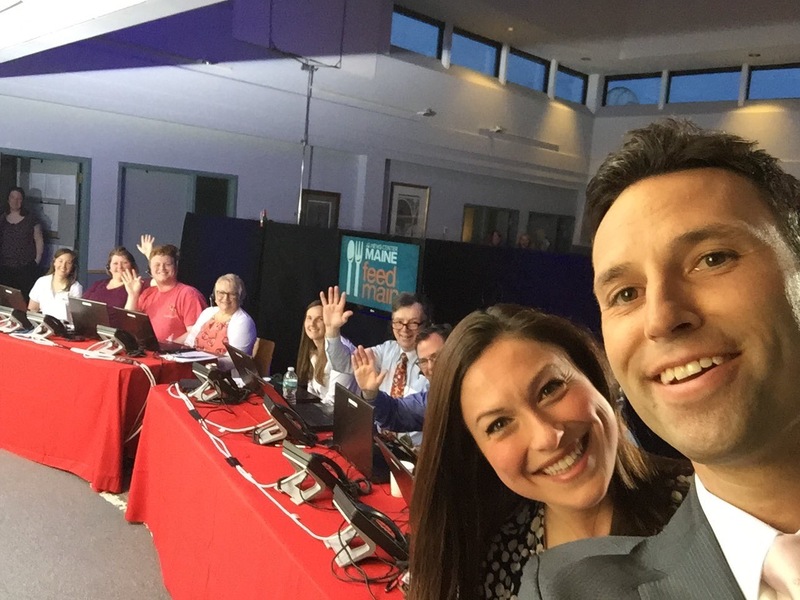 It was clear to me that this telethon and the station’s overall campaign to raise enough money to supply one million meals is a true team effort that they really care about. 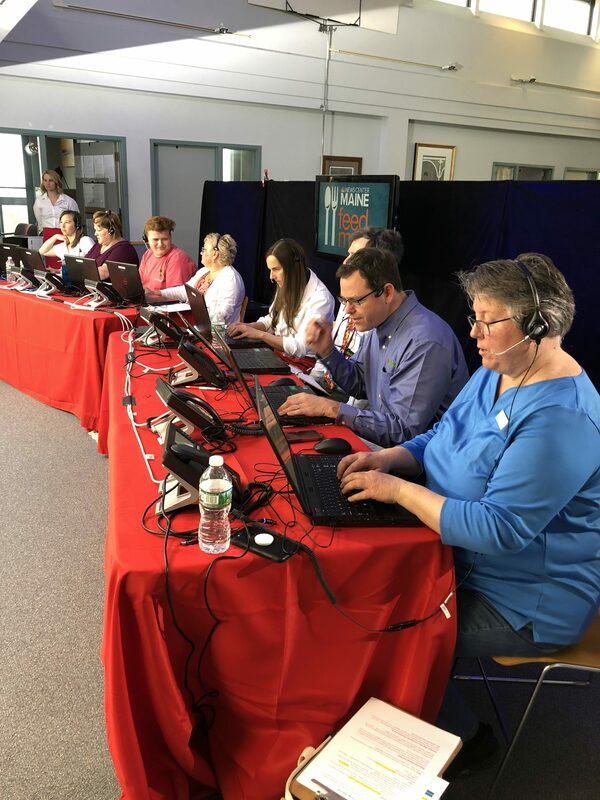 In addition to several employees from Good Shepherd Food Bank, volunteers from Gorham Savings Bank, Dead River Company, the Maine Mariners, Raymond James and Mid Coast Hunger Prevention Program all spent time answering phones. That’s a wonderful thing, but it’s especially nice to know that all of their employers allowed them to volunteer on company time. Kudos to those organizations for providing the only thing more important than coffee and Holy Donuts at 4:30am and that’s people to answer the phones! As co-sponsors, both Hannaford Supermarkets and Maine Honda Dealers have been tremendous supporters of the Feed Maine campaign in their respective marketing and promotional efforts since last September. On telethon day, both organizations went a giant leap beyond with donations of $23,540…EACH. These donations are in addition to the many other contributions these organizations make to Good Shepherd Food Bank and other charities throughout the year. If you prefer to do business with companies that share your values, I hope you find this information helpful and if you know of a company that is similarly generous, feel free to tell us about them on Facebook! 1,058 People Donated $79,311 and a total of $159,803 Was Raised! From the couple from Cape Elizabeth who called together and donated $300 to the lovely woman from Waterboro who told me she wished she could give more than the $25 she could afford on her fixed income, I was continuously awed by the generosity and compassion of the people I spoke with. Hunger in Maine is a statewide problem and viewers from all walks of life in every corner of the state took time out of their busy days to donate their hard-earned dollars to do something about it. Thanks to everyone who donated, the Good Shepherd Food Bank has $79,311 more dollars to turn into 317,244 meals. And my fellow volunteers and I are richer for the experience of speaking with them and hearing their stories. Some of my callers “have needed help before.” Others passionately explained that “no one in our state should go to bed with an empty stomach.” And then there was the woman who called because she was so thrilled that her ten dollar donation would feed forty people. In a state where fierce debates rage on where to find the best lobster roll, the best bowl of chowder or the best pint of beer, it was privilege for me to connect with the absolute best thing about Maine –the generous and caring people who live here. To learn more about the campaign, and how you can help provide 1,000,000 meals for Mainers, click here.